Why is it that we never run out of stories? Even the same story can be repeated and still entertain and stimulate the imagination. There are many stories to be found at the current exhibition at NON Berlin, titled Far From Any Road. This exhibition, featuring works by Anne Duk Hee Jordan and Ralf Tekaat, specifically pushes the definition of narrative and tries to find how and why stories are made. The works consider the relations – attractions and memories – between people or objects that compel us to make stories. Duk Hee Jordan’s work ‘Stone Project N.5’ captures the motion created when people encounter sensible objects. The view becomes the object that stimulates activity: a motion detector activates two pendulums with volcanic stones at the end of each branch. The stones begin to swing, with increasing magnitude, until they almost crash into one another, and then the mechanism stops and the pendulum slows. The contraption is magical and strange – the thin plastic arms of the pendulums end in a large, lumpy and textured stone, put into motion by a delicate though strong mechanical device on the ceiling. 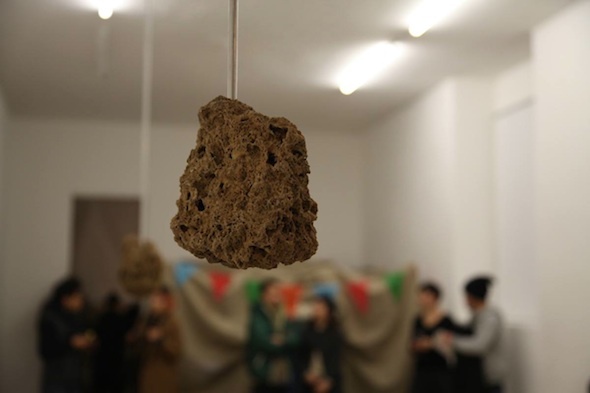 The work display a simple desire for closeness that becomes threatening to the viewer as the heavy stones swing through the gallery space. This honest desire to connect to things is what drives the loose and unaffected drawings of Tekaat. The arrangement of simple paper drawings traces the artist’s memory of the three secondary colors – purple, orange and green. Images, ideas and memories take new forms in strange arrangements, fragments of text explain or label objects or add explanations to the images. It is easy to learn the artist’s shorthand, and make sense of these multimedia compositions. Another work by Tekaat is a composition from his series titled Massifs, in which he draws a large scale, imaginary landscape that take shape from the lines and textures that emerge as he draws. This work was drawn on nine sheets of large paper that cover a huge portion of the wall, such that people walking up to it are swallowed in the rocky forms. This construction of a narrative space is echoed in the last work, an installation and five-channel video work by Duk Hee Jordan. Visitors are invited to enter a cloth tent set up in the back of the gallery that is filled with pillows, fur rugs, a low table, headphones, and five televisions playing the film. The video work deals with the artist’s past as an adopted child. She deals with the confusion of not being able to know the past by creating for herself an imaginary personal mythology. All the works in the show prompt the viewer to make their own assumptions rather than presenting a neatly packaged concept. The works spark curiosity, and frustrate any simple explanation. They impel us to come closer, to try to understand, to try to follow someone else’s associations, and as a result to make our own. On Saturday, Nov. 7, 2015, at 2 pm, there will be a free and public artists’ talk at the gallery. Both artists will be present and the conversation will be moderated by the curator, Elisa Rusca. The talk will be interactive: audience members can write something – a word, comment, or a question – on a slip of paper that will then be drawn from a bowl. The artists will answer or comment on what was written. The talk will be in English and German, and will be accompanied by complementary Mongolian appetizers and makkoli (a traditional Korean rice liquor).